All health care professionals are aware of this term “Babinski Sign”. It is an essential part of any Neuro-Assessment. As any other procedure, this sign is also topic of debate for a long time. However its use in clinical routine remains unabated. 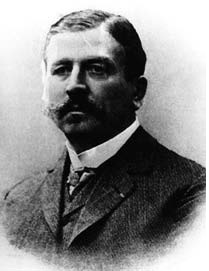 It was on February 22, 1896, that Joseph Francois Felix Babinski published his first report on ‘reflexe cutane plantaire’ [cutaneous plantar reflex] which became the sign that bears his name: ‘the Babinski sign’. He referred to the sign as “phénomène des orteils” (toes phenomenon) but is now usually referred to eponymously as the “Babinski sign” or descriptively as the extensor plantar response. This eponym refers to the dorsiflexion of the great toe with or without fanning of the other toes and withdrawal of the leg, on plantar stimulation in patients with pyramidal tract dysfunction. The neurophysiology of this reflex has not been completely elucidated. Each area of the skin of the body appears to have a specific reflex response to noxious stimuli. The purpose of the reflex is to cause the withdrawal of the area of the skin from the stimulus. The abnormal plantar reflex, or Babinski reflex, is the elicitation of toe extension from the "wrong" receptive field, that is, the sole of the foot. Thus a noxious stimulus to the sole of the foot produces extension of the great toe instead of the normal flexion response. The essential phenomenon appears to be recruitment of the extensor hallucus longus, with consequent overpowering of the toe flexors .The movements of the other joints remain the same. The corticospinal tract influences the segmental reflex in the spinal cord. When the corticospinal tract is not functioning properly, the result is that the receptive field of the normal toe extensor reflex enlarges at the expense of the receptive field for toe flexion. Toe extension is consequently elicited from what is normally the receptive field for toe flexion. The maintenance of territorial integrity of the receptive fields is apparently one way in which the cortex exerts its influence under normal conditions. Place the patient in a supine position and tell him or her that you are going to scratch the foot. Fixate the foot by grasping the ankle or medial surface with the examiner's hand that will be closest to the midline of the patient: examiner's left hand when the patient's left foot is being tested, and vice versa with the right foot. 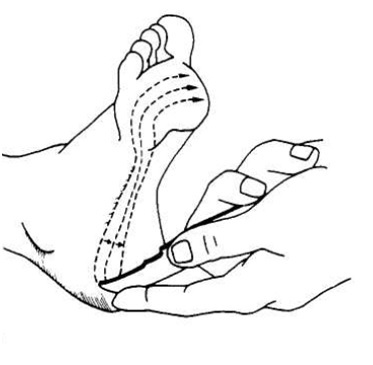 The first line to be stroked begins a few centimeters distal to the heel and is situated at the junction of the dorsal and plantar surfaces of the foot. The line extends to a point just behind the toes and then turns medially across the transverse arch of the foot. Stroke slowly, taking 5 or 6 seconds to complete the motion. Do not dig into the sole, but stroke. The plantar reflex is a nociceptive segmental spinal reflex that serves the purpose of protecting the sole of the foot. The clinical significance lies in the fact that the abnormal response reliably indicates metabolic or structural abnormality in the corticospinal system upstream from the segmental reflex. Thus the extensor reflex has been observed in structural lesions such as hemorrhage, brain and spinal cord tumors, and multiple sclerosis, and in abnormal metabolic states such as hypoglycemia, hypoxia, and anesthesia. A true up-going toe sign is reproducible, unlike voluntary withdrawal. An extensor response may be present when there is no damage to the pyramidal tract. On the contrary, cases with proven damage to the pyramidal system have had normal plantar response. The corticospinal fibres not only originate in different parts of the cortex, but also have different terminations. Babinski sign can be expected only when ‘leg fibres’ of the pyramidal tract are involved. ↑ 2.0 2.1 2.2 H. KENNETH WALKER, The Plantar Reflex, In:The Neurological System, Pg-369-370. ↑ Landau W. Clinical definition of the extensor plantar reflex (letter) .N Engl J Med 1971 ;285 :1149-50 .